To capture moving pictures, or video, with your Android phone, switch the camera mode in the Camera app to video recording. The same icon is used to switch between still and moving images. When video mode is active, the Camera app’s screen changes subtly: The Shutter icon becomes a Record icon. Touch that icon to start recording video. While video is being recorded, the Record icon changes to either a Pause or Stop icon. A timer appears on the touchscreen, indicating how long you’ve been recording video. Touch the Pause or Stop icon to pause or stop recording, respectively. As with taking a still image, video recorded by the Camera app is kept on the phone’s internal storage. You can peruse videos by using the Gallery app. The focus ring may not appear while you’re capturing video. Video recording uses the same zoom techniques as recording still images. 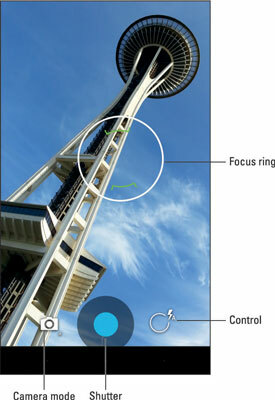 Some versions of the Camera app may allow you to grab a still image while the phone is recording. Simply touch the screen, and the image is snapped and saved. Hold steady! The camera still works when you whip the tablet around, but wild gyrations render the video unwatchable. Video is saved in the MPEG-4 video file format and feature the mpg filename extension. The files are found on the phone’s internal storage.